Early CSU Stanislaus commencement ceremonies were held in the Turlock High School auditorium. Sue Smith attended her college courses at the Stanislaus County Fairgrounds and graduated in 1963 in a ceremony at the Turlock High School auditorium. On May 31, she'll be on stage during commencement in the CSU Stanislaus amphitheater, on a campus that did not yet exist when she earned her degree. Smith and Myrle Wall — both graduates from the Class of 1963 — will be honored by the university as Golden Grads at this year's commencement ceremonies. The new initiative, brought to CSU Stanislaus by Interim President Joseph F. Sheley, will each year recognize alumni who graduated 50 years prior. In addition to Smith and Wall, others who were unable to attend will be recognized in the commencement program. For Smith, the Golden Grads recognition is a chance to reconnect with the university that provided access to an education she likely could not otherwise have received. "I could never have afforded to go away to college," said Smith, who graduated from Livingston High School and lived in Modesto while pursuing her degree. "I basically lived at home, like most of us did. It made college accessible to a lot more people in the area." Sheley said that while celebrating golden anniversaries of graduates is fairly common at other universities, CSU Stanislaus is a rare case in that it only recently marked its own 50th anniversary. 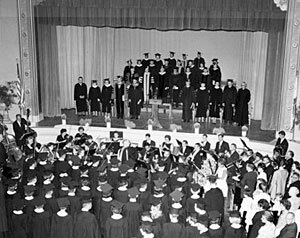 The university opened in 1960 as Stanislaus State College and held its first commencement in 1961, with 25 students receiving degrees. "We are so very excited about our Golden Grads and bringing to our current graduating class a link to this university's history," Sheley said. "We hope to expand the number of Golden Grads over the next several years. It is an honor and an inspiration to see them return to their alma mater." Smith earned a bachelor's degree in social science and went on to teach in elementary schools for 31 years, the last 19 in Manteca. She is one of three generations of her family with CSU Stanislaus degrees — her mother graduated in 1964, and her two daughters graduated in 1995 and 2000 — and she plans to celebrate this year with her family, including her 7-year-old grandson. And she feels great pride in being among the university's early graduates. When she and her husband moved to San Luis Obispo shortly after her graduation, she went looking for a teaching position. Most there had never heard of her college. "But my degree was just as good as anybody else's," said Smith. "And I got the job."